Fueled by hype and media, I wanted to cut through the fluff to see whats worth it. It just so happened I had the opportunity to check off two spots off of my list: Shake Shack in Palo Alto and Aria Korean Tapas in San Francisco. The newest outpost in the Shake Shack empire, Palo Alto is home to Norcal’s first Shake Shack, based originally in New York. The chain has a cult following of those devoted to their burgers, fries and of course, their shakes. I ordered various items, but I was interested in trying out the Shake Shack Burger, Cheesy Bacon Fries and Hot Dog. I’ll be honest, I haven’t been to the other locations out there, and many of my friends and colleauges who have say that they are all very different in the way they taste. While this is typically a by-product of the franchise system, many standards are set by the parent company to ensure that the product enjoys consistency throughout the brand. In short, I had no friggin clue what to expect. The burger was good, however, it wasn’t compelling enough for me to want to drive all the way to Palo Alto to have one. The hot dog felt like it had a whole lot of things I didn’t want to replace the things I did. The fries, however, were great and something about that cheese sauce that I can’t put my finger on, it didn’t taste like a prepacked goo you get from Costco, no, it tasted like the real deal there. Aria has been opened for over a few years now, but has a very strong following on social media, especially Instagram. Located in SF, more specifically the Tenderloin, the place is very tiny, with only a few seating spots inside. 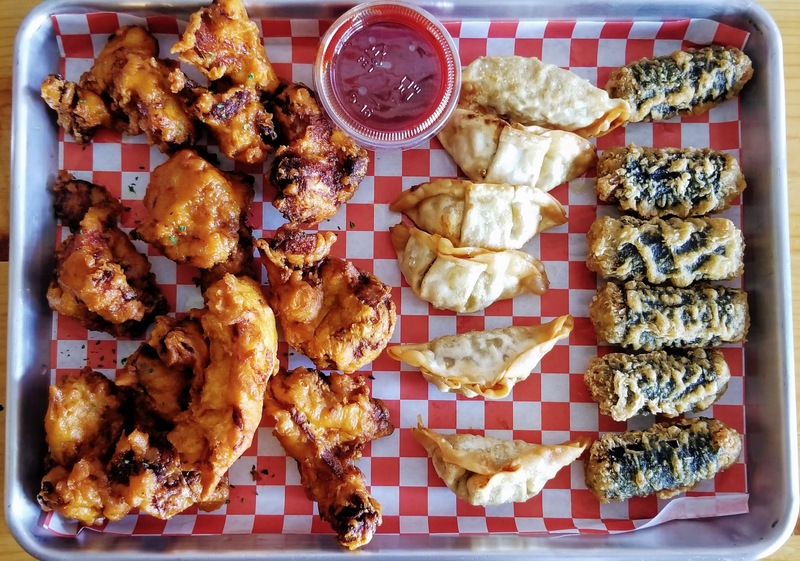 For this order, I got some Boneless chicken wings, some fried sushi rolls and some fried pot stickers, or Gyoza for those in the know. I sat down by myself for this visit to try them. The boneless chicken wings were crispy and soft, not cooked to dryness like other places. The other two things I ordered were good, but paired with the spicy sweet sauce, they were amazing. On that note, the sauce itself was amazing, sweet with some heat. There was so much food, I ended up taking most of it home to try out later, it actually held up quite well in my backpack for a few hours while I self-toured San Francisco. Overall, the long BART and Muni ride were worth the trip and I’d be down to go back again for another go. Hype is a two way street, it can work for or against you. The restaurant industry is no stranger to this concept, with that in mind, an owner has to balance different variables to achieve the success they’re looking for. With that in mind, do you have any places for me to check out? Let me know in the comments below. s/0 to Riceandtravel and Bobaiswhyimbroke for thier help with this article. 52 Weeks of Tacos – What does the internet have to say?